As well as Armas, Oscar winner Rami Malek, Captain Marvel star Lashana Lynch and Game Night actor Billy Magnussen all join the cast of Bond 25, director Cary Joji Fukunaga said. (Image: Youtube)James Bond 25 newsAna de Armas was revealed as one of the cast for Bond 25 at the live event in Jamaica on April 25. The 25th Bond instalment will be Craig's fifth outing as 007. Bond 25 is still untitled. Bond 25 is released in cinemas in April 2020. Since he emerged from the sea in a pair of trunks in Casino Royale, Daniel Craig has continued to reinvent the character of James Bond. Since he emerged from the sea in a pair of trunks in Casino Royale, Daniel Craig has continued to reinvent the character of James Bond. A Bond in the making: How Daniel Craig became 007He returns as Ian Fleming’s famed spy for a fifth outing in the upcoming Bond film, with other cast members announced at an event in Jamaica attended by Craig on Thursday. Asked about the appeal of Bond in a fan question, Craig said: “I think consistency, and the movies have been an event. 007 himself, Daniel Craig, is at the #BOND25 Live Reveal in Jamaica pic.twitter.com/F6KLGA9X5s — James Bond (@007) April 25, 2019“I mean, I think, for myself, I remember going to see them as kids, they were a moment. The world of business and media has begun to pay tribute to Feargal Quinn, who passed away following a short illness. The world of business and media has begun to pay tribute to Feargal Quinn, who passed away following a short illness. Chris Martin, CEO of the Musgrave Group, said: “We are saddened to hear of the passing of Feargal Quinn. “As the founder of Superquinn, Feargal was a visionary in Irish food and a retail pioneer. Beyond the world of retail, Feargal made a significant and lasting contribution to Irish society and to political life as a member of Seanad Eireann. Sokratis Papastathopoulos accepts Arsenal must win their remaining three Premier League matches to give themselves a chance of finishing in the top four – but he believes they can do it. Sokratis Papastathopoulos accepts Arsenal must win their remaining three Premier League matches to give themselves a chance of finishing in the top four – but he believes they can do it. Arsenal have away games at Leicester and Burnley left to play, either side of facing Brighton at the Emirates Stadium. Sokratis, who scored in the loss at Molineux, thinks taking the maximum nine points from those fixtures is within the Gunners’ capabilities. We know that now the chance could go, so we have to take the three points in all three games. 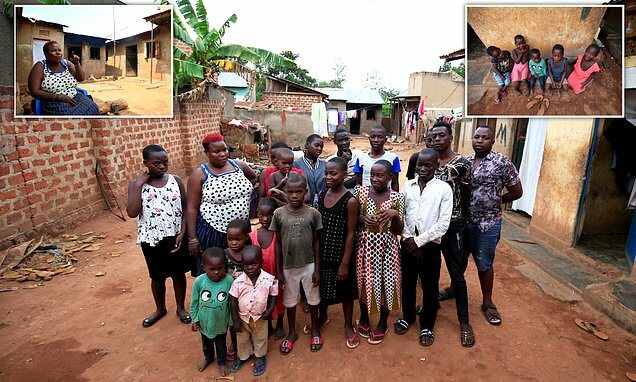 A mother has revealed how her unusually large ovaries mean she is unable to get pregnant with one baby at a time, leaving her with 38 children, including six sets of twins, four sets of triplets and five sets of quadruplets. Super-ovulators are rare, although if you have had non-identical twins, you are more likely to subsequently have non-identical twins again. Mariam's desire for a large family has its roots in tragedy. A single day can require 25 kilograms of maize flour for the family, Mariam says. However, providing a home for 38 children is a constant challenge. Latest: Sri Lanka’s prime minister has acknowledged that minority Ahmadi Muslims who are refugees from Pakistan have faced attacks since the Easter bombings. Ahmadi Muslim refugees form a human chain to pass food (Gemunu Amarasinghe/AP)Sunday’s Islamic State-claimed suicide bombings killed over 350 people. Sri Lankan police spokesman Ruwan Gunasekera did not answer repeated calls and messages seeking comment, but earlier said 58 people had been detained since the bombings. Most were Sri Lankan but the Foreign Ministry has confirmed 36 foreigners died. Sri Lankan cemetery workers stand by freshly buried graves (Gemunu Amarasinghe/AP)Sri Lankan government leaders have acknowledged that some intelligence units were aware of possible terror attacks against churches or other targets weeks before the bombings. 48 measles cases were reported in Ireland in the first 15 weeks of this year. It comes amid news that 169m children worldwide have missed out on the measles vaccine in the last eight years. The HSE is reminding people of the importance of getting vaccinatedIreland has seen a 244% increase in measles cases in the last three years. According to UNICEF Ireland, there were 86 cases here last year, up from 25 on the previous year. READ MORE Millions of children miss measles vaccine leading to outbreaks worldwideDr Suzanne Cotter, a specialist in Public Health Medicine, says vaccination is the only way to avoid the disease:"The only way to prevent measles occurring is through vaccination. DANIEL Craig will star for his fifth time as James Bond in the untitled 25th movie of the spy thriller franchise, producers said on Thursday. DANIEL Craig will star for his fifth time as James Bond in the untitled 25th movie of the spy thriller franchise, producers said on Thursday. Oscar winner Rami Malek joins Bond cast as Daniel Craig returns as 007 for the fifth timeBohemian Rhapsody star Malek joins Craig, who will reprise his role as the iconic spy, as well as returning cast members including Ralph Fiennes, Ben Whishaw, Rory Kinnear, Naomie Harris and Jeffrey Wright. The news was announced at an event attended by the cast and producers Barbara Broccoli and Michael G Wilson in Jamaica. Rami Malek with his Oscar (Alberto Rodriguez/AP)Speaking about the casting, Oscar winner Malek said he was "very much looking forward to joining the whole cast and crew". JUST four teams can credibly challenge Dublin for this year’s All-Ireland SFC title, according to Kieran Donaghy. JUST four teams can credibly challenge Dublin for this year’s All-Ireland SFC title, according to Kieran Donaghy. Kieran Donaghy announced as newest Sky Sports pundit - and names the four teams that can beat Dublin this summerHowever, the retired Kerry star also stressed that it will take an underperformance from Jim Gavin’s team to stop them achieving a historic five-in-a-row later this year. "I think there’s genuinely four teams that can beat Dublin," he said, "but for that to happen, the three or four of them have to play out of their skin and Dublin have to have an off-day. Peter Cavanan, meanwhile, predicted Kerry will stop Dublin doing what they failed to do in 1982 by halting their bid to win a fifth All-Ireland title in successive years. Fans will have to wait to find out the name of the 25th instalment of the long-running James Bond franchise. Fans will have to wait to find out the name of the 25th instalment of the long-running James Bond franchise. The quirkiest film titles in the James Bond franchiseFrom the pen of Ian Fleming to an international film phenomenon, 007 has thrilled audiences since the 1950s. With the rumoured working title of Shatterhand, here is a list of some of the quirkiest titles in the franchise. GoldenEyePierce Brosnan was Bond in GoldenEye (Stefan Rousseau/PA)The title refers in the film to powerful electromagnetic weapons, but Goldeneye was also the name of Fleming’s estate in Jamaica. City's win took them back to the top of the Premier League table ahead of Liverpool and served as the latest blow in a gripping title race. (Image: Liverpool FC via Getty Images)“It was really the result I expected," he said at his pre-Huddersfield press conference on Thursday. “United tried whatever they can, in the first half especially, but in the 95 minutes it was clear they can’t stand City in the moment. "They were unlucky in moments but then they couldn’t stand City.”Klopp also responded to Pep Guardiola's claim that both City and Liverpool deserve the title this season. “That’s really good, that’s all I can say about it. Hetal Saroli had leaned over to look at her schoolfriends on the street below, before suddenly falling towards the ground. Gut-wrenching video shows Hetal smash into the bike shed canopy - before it gives way and she plunges through it. (Image: Dinesh Dubey / SWNS)(Image: Dinesh Dubey / SWNS)Despite suffering 18 injuries, including a broken hand and damage to the chest and stomach, Hetal survived the fall on Saturday, April 13. (Image: Dinesh Dubey / SWNS)(Image: Dinesh Dubey / SWNS)Surgeons had to perform a tracheotomy and needed to intubate Hetal as they set her broken limbs and performed surgery to her abdomen. Doctors say Hetal will need a number of operations to treat her many injuries, including extensive fractures to her ribcage. 37-year-old Britney gave fans a look at her energetic routine which involved lifting weights followed by sit ups on an exercise ball. Yay for me," Britney gushed in the caption as she posted the home footage to Instagram along with two winking emojis. Britney was reported to have been struggling in recent weeks after her dad Jamie fell seriously ill and underwent emergency surgery when his colon ruptured. Speaking to the camera, Britney said: "Hi guys, just checking in with all those that were concerned about me. Earlier this year Britney and her family were left devastated when her dad Jamie underwent emergency surgery following a life-threatening illness. Oscar winner Rami Malek, Captain Marvel star Lashana Lynch and Game Night actor Billy Magnussen will all join the cast of Bond 25, director Cary Joji Fukunaga said. Oscar winner Rami Malek, Captain Marvel star Lashana Lynch and Game Night actor Billy Magnussen will all join the cast of Bond 25, director Cary Joji Fukunaga said. See you all soon.”The much-anticipated title of the next film, currently referred to as Bond 25, was not confirmed. Lashana Lynch has joined the cast of Bond (Ian West/PA)Broccoli spoke about the film’s plot, saying: “Well, Bond is not on active service when we start the film. He becomes the first ever American to helm an official Bond film.